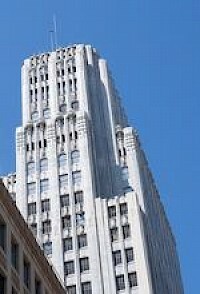 The PacBell Building or 140 New Montgomery Street in San Francisco's South of Market district is a Neo-Gothic, 435 feet (133 m) office tower located close to the St. Regis Museum Tower and the San Francisco Museum of Modern Art. The 26-floor building was completed in 1925 and was San Francisco's first significant skyscraper development when construction began in 1924. The building was the tallest in San Francisco until the Russ Building tied its 435 foot (133 m) height two years later in 1927.